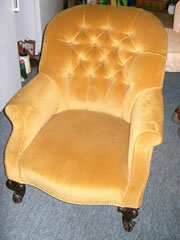 A very nice Victorian nursing tub type chair with mahogany cabriole legs covered in gold velour. 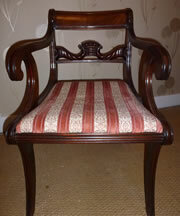 30in high x 26in wide. 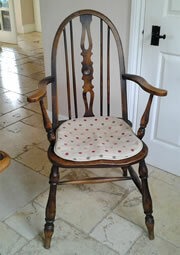 This chair is in excellent condition. 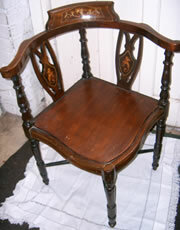 An excellent Victorian mahogany open arm armchair with excellent carving to the cabriole legs arms. 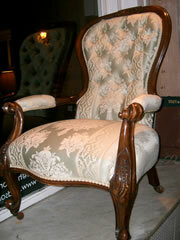 The back of the chair is covered in pale green and cream patterned damask. 30in high x 24in wide. 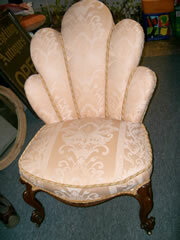 A very pretty shell shaped nursing chair with mahogany cabriole legs covered in lemon-patterned damask. 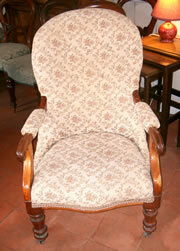 An early Victorian buttoned back open armchair with mahogany carved arms and turned legs covered in a tapestry fabric. 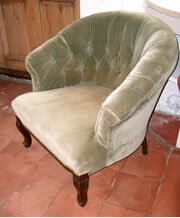 A very comfortable tub chair c1900/1910 covered in green velvet with carved cabriole legs, we can arrange upholstery if required, price £95.